Every January the global ski industry convenes in North America for international bragging rights. After 37 years of Las Vegas playing host, the dog and pony show was moved to Denver’s spectacular Colorado Convention Center last year where some 845 brands exposed their latest and greatest—and Ski Canada was there to look, listen, poke and prod. After four days on the show floor, we took a few samples off the shelves and put them to the test on the slopes of Colorado’s Front Range ski areas. And now we present that research to you. Thank the economic crash for increased price slashing throughout the ski industry. This year manufacturers are giving you more bite for your buck. Here are some of the highlights: Atomic puts its step-down sidewall in its All-Mountain Nomad line (p. 49), a rockered ski at an entry-level price point, and racing Double Deck technology, which swept the GS podium in Vancouver, in its Frontside Varioflex line (p. 42). Rossignol says its Avenger All-Mountain series delivers the most versatile performance at competitive price levels (p. 50). Völkl has democratized the park-and-pipe scene with its Ledge, Pearl, Alley and Gem. Blizzard’s Compact Ride System series (Cross Ride IQ and Sport Ride IQ) enables budget-minded intermediates to buy into a lightweight semi-sidewall/ semi-capped ski with its patented IQ binding technology. Fischer introduces its premium C-Line ski technology throughout its entire collection of skis. C-Line features a Full Carbon Jacket construction, improving torsional stiffness and durability without adding on the pounds. All C-Line models also offer the new Flowfl ex 2.0 with the Tune-It feature, which adjusts flex according to the skier’s weight, ability, style and snow conditions. Look for the carbon fibre graphic, and ski the difference. Four of last season’s top five-selling boards were rockered. Expect more of the same this year as the trend picks up, even in the east. K2, as always, leads with six different rockered profiles through its line—everything from 100% traditional camber, to 50% camber/50% rocker for powder, to camberless skis with 20% rocker for big-mountain jibbing. Nordica has revitalized graphics throughout its line. Expect a younger, more exciting look on everything from its Dobermann race series, which now comes in lively blue and pink, to the radical 127-mm Raddict. The latter comes with pure symmetrical sidecut, flex and swing weight with high-rise rocker—and a smiling skull that says it all. This fall, homegrown Canadian Boomtown Sports Inc. is putting out its new Ullr, a rockered bamboo powder ski. Cheering loudly from the technology bandwagon, wind-powered Liberty puts bamboo laminate in every core it manufactures. The product makes more than green sense; it works as a performance enhancement. And Liberty stands behind it, claiming the best warranty in the business—three years. 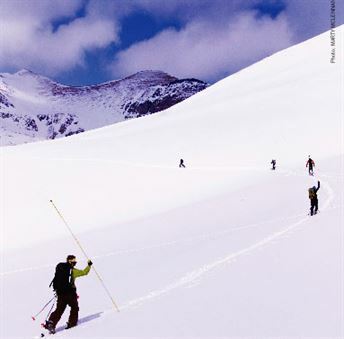 According to the Snow Industries Association’s research, powderhounds are on the increase as Alpine Touring (AT) and Randonée sales jumped 58 per cent last season. To feed the need, Salomon presents the Quest, a six-boot series of performance hike and ride boots weighing in at 1.7 kg/boot. Atomic’s Tracker and Dalbello’s V.i.r.u.s series start at 1730 grams and likewise aim at providing lightweight quality contenders to the backcountry. Black Diamond’s Efficient series offers four new high-performing AT boots weighing in at 1640 grams. Scarpa also brings two new superlight AT models—the 1530- gram men’s Maestrale and the 1330-gram women’s Gea—and the freeride-specific Mobe (1780 g), Hurricane (1870 g) and women’s Shaka (1640 g). Last and least (in weight), Dynafit’s two-buckle TLT5 series is a no-holds-barred touring boot starting at 1050 grams. Turn to page 62 for more on these and other boot novelties this season. After a short absence, Austrian manufacturers Kneissl, Blizzard and Kästle are back in North America. Their 2011 quiver of skis covers the gamut from frontside to freeride. All of these companies come with a long racing heritage, so expect high-quality product made to be skied hard and fast. All three also took part in this year’s Ski Canada Test. Welcome back! Love the way you look in corduroy? Take your knocks in the park? Check Current Issue. Check Back Issues for previous Buyer’s Guide issues.